I do not support Buhari because I think he is the Messiah; I support him because I see him as a simple and rather ordinary man who only always strives to do his best. I do not support Buhari because I think he has all the magical answers; I support him because I am convinced he is not arrogant or insolent and will listen, feel and absorb our input to do what is best by us, with us and for us. I do not support Buhari because I think he is perfect and has not made mistakes in the past; I support him because I am convinced that through it all he has learned, gained tremendous wisdom; grown with Nigeria and learned the important lessons to today deliver to us a new best, in a new effort to make Nigeria as perfect as it can be. I do not support Buhari because I think he will be the War Against Indiscipline General of the 80’s; no, I support Buhari because I am convinced that he will temper justice with mercy, he will first give us hope and promise, helping us re-establish trust, fate and confidence in the government and ourselves before he focuses on seriously cordoning our excesses. This I believe he will do in cognizance of our chronic malodorous state. 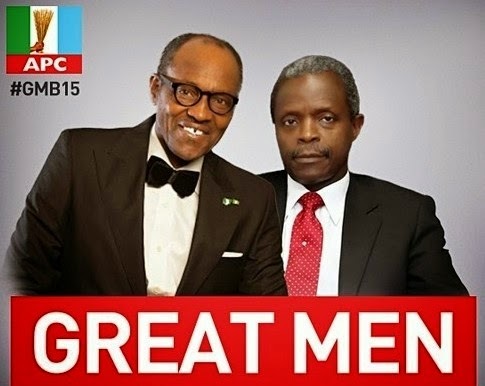 I do not support Buhari because of the region he is from; I support him because I know he is for all regions. I support him because I have seen his unique ability to work with and for people of all regions including mine. I do not support Buhari because he has had it easy and had a silver spoon; I support him because I have watched him through it all, taking unbearable pain, accusations and unfair insults worse than I ever have; he has been a victim like me, and been graceful through it all, taking it all in, with unsurpassed patience. I support him because he has suffered and bled with Nigeria. I support him for his courage and dedication to serve Nigeria and his maturity in responding to the jingoists and libelous ruling politicians and their media men. I support Buhari for patiently and responsibly taking Reuben Abati to court and securing a judgment against the desperate presidential spokesman for the libel that was intended to tarnish his good name. I support him for his empathy, accepting Jonathan’s plea for him to settle the case with Reuben Abati out of court. I support him for his show of courage, compassion and forbearing in the face of the highest level of provocation and tempering justice with mercy. [See: How Buhari Won Libel Suit against Reuben Abati in “Reuben Abati: Nigeria’s Evil Genus?” Link: http://ends.ng/?p=1252 . And See: How Jonathan begged Buhari To Settle Reuben Libel Suit Out of Court in “It Was PDP That Promised To Make Nigeria Ungovernable in 2011, Buhari Never Did;” Link: http://ends.ng/?p=1295]. I support Buhari because in the past he made Nigerians proud and Nigeria strong and stood up for our true economic growth against the whims and wishes of the colonialist. I support him because he refused to bow to the pressures of the World Bank and IMF and put Nigeria on its own course of self-development with only Nigeria’s interest at heart; earning himself the wrath and the foreign sponsored coup to depose him. A true pro-African leader in the ranks of the Nkurumahs and Sankaras. I do not support General Buhari because he will ever be a puppet, fool and slave to the colonial master, or beg them for arms, etc as the incumbent does, on the contrary, I support him because putting corrupt cabal and billions of Naira accused looter Dikko in a suitcase to repatriate him from his safe haven in the colonialist UK who hide him and his loot away from the justice of Nigerians, is so me. Gangsta! I support General Buhari because the Cabal are scared s-h-!-t of him, even those in his own party; just as those in late Yar’Adua’s party were scared of the President and are even accused of poisoning him to speed his death! I do not support him because I believe he will be able to do it all by himself. I support him because now I and many like me have realized what he stood for and we will fight to ensure that this time we together protect, ensure and secure the Nigerian dream. I support Buhari because he has a dream for Nigeria… and I am in that dream.